When you book online at www.newplacehotel.co.uk or direct at the hotel we GUARANTEE you will get the best rate. What is a lower rate*? If you find a lower rate on another website then it must be for the same hotel, for the same date(s), for the same room type, for the same number of guests, in the same currency and must be publicly available for booking via the Internet. What do I do if I find a lower rate*? Fill out and submit the online claim form. How long do I have to submit the online claim form to get my rate adjusted and the 10% discount? Submit the online claim form within 24hrs of booking and two business days prior to arriving at the hotel. A Reservation agent should respond via email within one business day. If your online claim form is sent outside of normal business hours, it will be processed the next business day. Normal business hours are Monday through Friday, 8:00 am – 8 pm. Saturday – Sunday 9am – 4pm. What are the requirements to get the Guarantee? Bookings must be made via www.newplacehotel.co.uk or direct at the hotel. Guests must have a Reservation confirmation number. The lower rate* on another website must be for the same hotel, for the same date(s), for the same room type, for the same number of guests, in the same currency and must be publicly available for booking via the Internet. A Customer Service agent must be able to verify the lower Internet rate* for the applicable date(s). What is the turnaround time for adjusting my rate? A Customer Service agent should respond via email within one business day. If your online claim form is sent outside of normal business hours, it will be processed the next business day. Normal business hours are Monday through Friday, 8:00am – 8pm. Saturday – Sunday 9am – 4pm. Your new rate is not effective until you receive your new confirmation number from Customer Service. 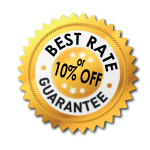 The Best Rate Guarantee does not apply to rates that require membership, association rates or other negotiated rates.